← Recipes on the Road: Mead brewed with chamomile! We are striving to live a more simple life. To clear the clutter so that we can form a more meaningful view of our world and cultivate the best relationships possible. Sometimes simplicity isn’t easy, our attachments to certain things surprise us. I got a call on the Monday morning after the July Fourth holiday week that poked a twinge of anxiety, leading to a brief near-panic attack while at work. 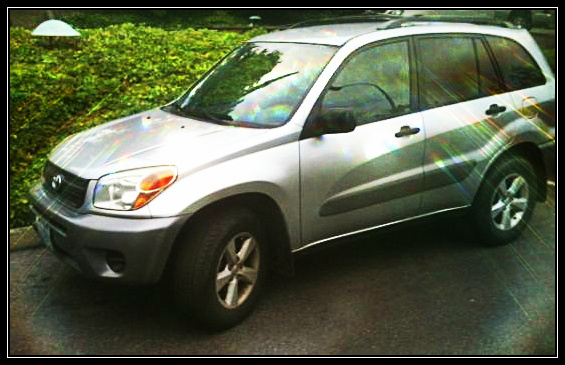 The decision to sell my pristine, newest-car-I’d-ever-owned, Toyota RAV4 was made about a month earlier. A friend, Jimbo, offered to show the car for me and field calls since I would be busy with work — and maybe because he knew it would be easier for me to part with such a large possession if I didn’t have to be the one to hand over the keys myself. I’ve sold many cars, only to get rid of them in favor of something newer. But this sale really represented commitment and dedication to something better. Something more than a car. The steel cocoon was just another bubble of false security. No longer would I have that layer of familiar to and from, work to home, the same stereo system, windshield wipers and reliable blind spot…. Reasons why we decided to sell our newest car abounded. Two of us could share our Honda sedan. We could put the money toward the bus and our projects. With Kristina working at home most of the time, and the bus running like a champ, three cars just seemed unnecessary. There was no action during the holiday week, so I re-posted the ad the following Monday and Jimbo got immediate response. I guess my low mileage gem was priced right. With the great help of Jimbo, the car sold to the first person who called after three days of negotiations between them and two other potential buyers. The insurance people wanted to know – why did I sell the car? Was it a good car? Did you get what you wanted? It was a good car. Pangs of guilt and fear shot through me in paralyzing bursts the rest of the afternoon. The reliable and safe ride, day in and day out for the past six years provided my needs from dog carrier, lumber hauler, date night cruiser, and music gear packer. Immediately the “What ifs?” began swirling in my brain…. I began to sweat, my heart raced, my stomach tensed and The Fear came… What if I needed that car at some point? What if my parents found out? What will my friends say? It was a great car, should I have kept it? Am I really stupid? What if? What IF?! …My inner debate continued: Cars are never a good investment… and this isn’t a classic vehicle. It’s a Toyota SUV. More to the point, it’s a CAR. Just. A. Car. We still have two other vehicles between the two of us, this shouldn’t be such an emotional roller coaster! Next thing I knew, the handshake was done, the cash was in the bank, and I was standing on the sidewalk about to drive to work like any other day. So much inner turmoil had occurred as I prepared for this sale, and in reality — here were the things that had changed: We had money to get the bus interior completed, more room in the driveway, and a way cheaper insurance bill. Insurance and registration alone saved us around $1,500 a year – before gas and maintenance. The dogs will still get to the river, the cargo will still get hauled, and we’ll still get around town. And country. In our very own, really killer style. Simple isn’t always easy — at first. But I think it may just pay off. Postscript: The day after I sold the car we had a family medical emergency that required us to buy plane tickets back to the Midwest. We then found out that one of our dogs would need major surgery. Days later we were informed that some repairs would have to be done on the bus and that we had to get a new transmission system for our Honda! My first thought was, “Oh crap I can’t believe I sold my (good running) car.” My second (more rational) thought: “This all would have happened anyway. Thank goodness I sold my still-running car.” If we hadn’t parted with that car, this Free Range Quest may have come to an abrupt halt. Good for you! Mark and I decided we could live with one car between us about 10 years ago. I can honestly say that we’ve had, maybe, three times in the past decade where it’s been a real logistical problem for us that required us renting another vehicle (I now am part of a car share for such occasions). What do we do instead? We talk logistics. We work it out. We ride mass transit. We walk or bike. It’s become automatic now, even though there were some “shrinking” pains at first. Simple problem solving skills, right? I think it seems to some (and it seemed to me in the beginning) that this would make our life more complicated, but it’s really so much simpler — The most complicated issue so far being that if I need the car during the day, I drop Dave off at work… If there’s an “emergency” there are a ton of options, the obvious being that I just lug that big bus around town a bit — The cost of our vehicles vs. the benefit of selling = obvious decision… We haven’t sacrificed any freedom. It only feels weird to me that we didn’t do this sooner! Thx for reading, Lisa! Thanks Lisa – Always looking for simple inspiration!